We’re all limited by the amount of time we have each day to get things done. That’s why it’s important to know how to bend time to your will. The majority of hard working people want to practice good time management, and they start out with good intentions, but they forget to figure in everything that sabotages time. The 25 Time Management Tips PLR report will help your readers improve their time management skills. A 12-page report that includes a title page, disclaimer notice, table of contents, and 8-pages of time management tips woven throughout. You’ll receive the content in both Word and Text formats. 24 Ready-to-use PNG social media images. The social media tips are easily transformed into Tweets for Twitter content. You’ll find 25 tweets to direct traffic back to your landing page. Add hashtags to suit your needs. Twitter tweets provided in Excel (XLS) and Text formats. Use these reusable 600 x 1200 graphic backgrounds to announce your special report and gain new subscribers from Pinterest. 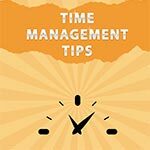 You can also use any of the backgrounds to create short infographics that display time management tips. 5 – Pinterest Pins with Blank Background. Use the flat cover with eCover Authority or Box Shot King to create a new cover or other miscellaneous graphic displays. 1 – Powerpoint layout file for social media tips. 1. Build time into every aspect of your day for those interruptions that we all experience. You will never have a single day that’s not interrupted by something unexpected, which usually throws people off course. It can break your concentration, making it harder for you to get the flow back. If you’re at work and someone pops in for “just a minute,” you’ll notice that it always turns into a lot longer. Before you know it, half an hour to an hour will have passed, and you can’t get that time back. At the end of five minutes, if the other person is still there, you say, “I’m sorry, but my time is up, and I have to get back to my work.” If you respect your time, others will, too. 12 – Page, 3,070 Words, Report / DOC & Text formats. 24 – Social Media Tips / PNG & PPT formats. 25 – Twitter Tweets / Excel (XLS) & Text formats. 5 – Pinterest Pins / 600 x 1200 PNG format. 1 – Blank Social Media Background / PNG format. 1 – Brandable Thin Report Cover / Flat – PNG format. 1 – Brandable Thin Report Cover / 3D – PNG format.